Per Bylund has sent out this interesting tweet. He makes the assertion in the tweet that "It is mind-boggling so many get it [Says' Law] wrong." 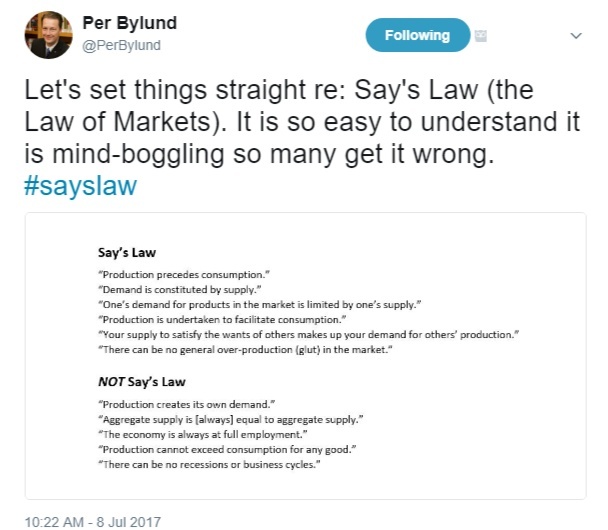 But I would argue that it is should not be mind-boggling given the various descriptions of Say's Law and NOT Say's Law that Bylund correctly lists. Although some are less clear than others, they are all terribly formed descriptions of a very simple concept. What the hell kind of writing is "Demand is constituted by supply" or "Your supply to satisfy the wants of others makes up your demand for others' production"? The second is technically correct, the first is edgy, but all this reminds me of the scene in the bar in Good Will Hunting where a first year Harvard grad student is trying to show off more than he really knows.Who the hell talks like this to explain a topic? It's the kind of way you would write if you were constipated after drinking a quart of ready-mix just before is solidifies. John Maynard Keynes really came to the rescue here (sort of) in The General Theory when he describes Say's Law as "supply creates its own demand." He probably coined the phrase. But this is Keynes and he went off the deep end to use it in discussing and "refuting" the Law in an aggregate fashion using aggregate demand and aggregate supply. But the phrase is sweet. "Supply creates its own demand," I love it! If you somehow in your backyard build a brand new BMW, there is going to be demand for it. If you build a fully functional luxury house on prime beachfront real estate property, there is going to be demand for it. You may or may not like the price, but supply always creates its own [money] demand. This is the case for all economic goods. Here is the important backstory. In the early 1800s, Jean Baptiste Say wrote to battle the notion that there could be an overall glut of goods in an economy and that such a general glut is what caused economic downturns. Say...pointed out the wants of man are unlimited, and will continue to be until we achieve genuine general overabundance---a world marked by the prices of all goods and services falling to zero. The basic practical meaning of Say's Law was implied in J. B. Say's rhetorical question: "how could it be possible that there should now be bought and sold in France five or six times as many commodities as in the miserable reign of Charles VI?" Henceforth, during the whole rest of the nineteenth century, the acknowledgment of the truth contained in Say's Law was the distinctive mark of an economist. Those authors and politicians who made the alleged scarcity of money responsible for all ills and advocated inflation as the panacea were no longer considered economists but "monetary cranks." Notice Mises reference to monetary cranks who argued that there was a scarcity of money. When we understand that there is never a money demand problem for economic goods, we understand Say's Law. Supply creates its own demand. Build a BMW and you are going to get some kind of demand for it. A money demand. That is why the explanations that go along the lines: "Your supply to satisfy the wants of others makes up your demand for others' production"." are technically correct but are a terrible way to explain Say's Law. If I am going to build a BMW in my backyard, I am not going to think "My supply to satisfy the wants of others makes up my demand for others' production." I am going to think "Yeah, I just built this beauty of a BMW and I going to be able to sell it for a lot of money." It makes the point with much greater clarity. It is true I want the money to buy other goods (or save) and that the person paying me likely received it for producing something. But this is one degree away from the actual transaction, when I start talking the production needed to get the money to buy the good---and then eliminate the notion of money from the explanation! Money demand for a product produced, especially given that Say's battle was used to fight off monetary cranks who argued there was not enough money in circulation, is where the explanation for Say's Law should stop..
Why would you take out money in your explanation, throw in a second-degree products produce demand notion, which is not only complicated but eliminates the front line stopper against the money cranks? Say's Law is simple, when expressed simply; Supply creates its own demand, that is, if you create an economic good someone is going to be willing to pay you something for it. There are second-degree factors, third-degree factors and more but if we want to battle the erroneous notion that a general glut can occur, and money shortages can occur, "Supply creates its own demand" is the way to go. How does the pithy formulation "Supply creates its own demand" deal with entrepreneurial error, i.e., production of a good that no one wants (or no one within the entrepreneur's realistic reach)? I thought one important aspect of Say's Law is that in a world of specialization (i.e., no autarky) and voluntary exchange, in order to obtain something one desires but did not produce, one must produce something another desires but did not produce, and engage in trade. If you produce something that no one desires, you have nothing to trade and thus cannot consume the produce of others. Well, thanks for your pithy comment but I cover that when I state it applies only to "economic goods." Yes, you do cover that in your post, but the words "economic goods" don't appear in the phrase "Supply creates its own demand." Maybe some of the confusion that surrounds Say's Law -- such as you highlight in your subsequent piece about the CNN article on Rick Perry -- is because formulations are too pithy. It would be like saying "Fiat money causes the business cycle" and then scratching our heads as to why people can't appreciate the ABCT. Value is surly subjective. How do you square that circle? Supply of X constitutes demand for Y,Z,etc. The answer is right there. You produced X, but the owner of Y doesn't want X. You must produce Z (or whatever the owner of Y desires) in order to trade. I agree here with The NAPster and steveZ. The distinction that we must produce something or supply something that people want is key. Many average people, and among them some leading Keynesians, imply that businesses simply produce whatever they want, and people will buy whatever it is that was produced; no less do they imply that the businessman picks his rate of profit, and people still buy. To avoid this confusion, I prefer something closer to Rothbard's rendition. Economic downturn- your BMW sits, unsold. They say, "it's ok RW, we've read JMK and are printing your demand right now!" How do you explain reality to them using your version of Say's law? I hereby bid one dollar. Markets clear. It is always a function of price. And that price could be negative. I'll charge you $50 to haul it away. Sure but if everyone accepted that, by definition there would be no such thing as a recession. How would that eliminate the business cycle? I'm saying of course markets will clear. Nobody will deny that. But that's what a recession is: all (or a significant portion of) prices falling. The money cranks want to print to prevent this, to increase demand. Hence their attack on Say's law. "Demand is derived from supply." Sooooo, if someone produces (supplies) something that no one values, there will be exactly that degree of demand - none. The amount of "value" that a person (A) can demand is established by the "value" that a potential seller (B) attaches to whatever A offers in exchange. I think it is by Say's Law that we justify the statement that supply and demand are the two sides of the same coin, and the coin itself is any economic good.